It’s finally here. The novel I’ve been waiting since last September for has arrived. Empire State was one of the best books I read last year, so to say I’ve been anticipating the sequel is an understatement. And it’s finally here. The Empire State is a pocket dimension created during the last great fight between superhero rivals the Skyguard and the Science Pirate over the skies of Manhattan. It’s an imperfect copy of Manhattan that exists opposite the ‘real’ New York through a gateway between dimensions called the Fissure. Still with me? Okay, good. The Age Atomic focuses again on private detective Rad Bradley. The events take place several months after the end of Empire State, sort of. It’s been several months in the Pocket, but in the Origin (the ‘real’ world) it’s been years. Yes, the Age Atomic has dropped the 30’s prohibition era and moved into the 50’s. Cold War! The Reds! Atomic Warfare! Rad, along with new character Jennifer Jones, is investigating why the Empire State seems to be dying in the wake of the Fissure’s disappearance. Meanwhile, over in New York, a new group called Atoms For Peace, led by the strange Evelyn McHale is preparing for war against the Empire State. And I’m going to stop there with this summary, because saying much more would spoil it. First things first. I’m so happy Adam Christopher decided to return to the world of Empire State. I believe he had said at one point he intended to never write a sequel, but this world seemed too unique and cool to confine to a single story. I’m also glad he decided to write in a slightly different genre than the first one, because it was ripe for this kind of 50’s sci-fi pastiche. I described Empire State as “pure noir silver age comic book sci-fi pulpy nonsense” and meant it in the best way possible. The Age Atomic drops some of the noir and comic book stuff, but ramps up the pulp and sci-fi, and it works so well. It results in a story that’s more intimate and focused, but no less nutty in terms of execution. Rad Bradley (named after a misspelling of author Ray Bradbury, though I’d like to believe DC Comics’ Slam Bradley had a hand in it) is a wonderful character, embodying many of the tropes of a classic noir detective. In a book full of great characters and ideas, Rad stood out the most to me in Empire State, and he’s on fine form here too. Fortunately, the new characters are just as strong. Jennifer Jones is headstrong and capable, and a great foil for Bradley. Should the series continue after this point, I hope above all else that their partnership continue and evolve in the fashion it does in The Age Atomic. Evelyn McHale also makes for a fun villain. Based on the real woman who jumped tragically from the top of the Empire State Building, Evelyn is a quantum ghost. That is to say, she’s a bit like Dr Manhattan from Watchmen. Despite the absence of comic book superheroics compared to the first book, it was nice to see elements like this cropping up (there’s also a minor character called Agent Morrison who I really hope was named for a certain Scottish writer). Evelyn’s plan is nefarious, she has a creepy way of showing up out of the blue in different scenes, and her final motivation is far from what I expected. It should go without saying that I think you should read The Age Atomic. Read Empire State first, but then read The Age Atomic. I won’t say it’s better, or that it’s worse. It’s an entirely different beast that retains elements from its predecessor. I saw a comment online somewhere that referred to this sort of book as ‘time wasting mediocrity’. I respectfully disagree. 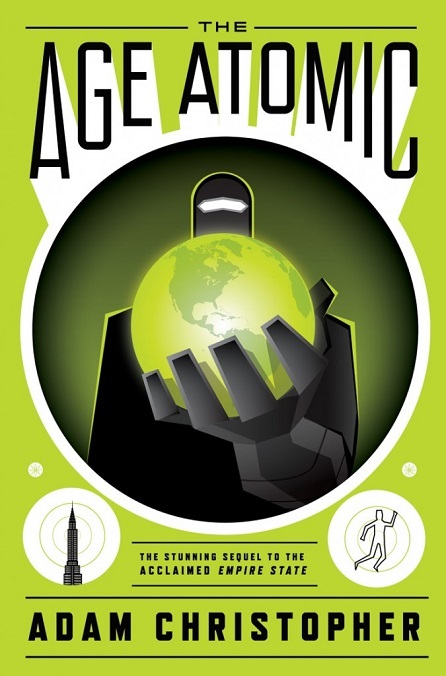 The Age Atomic is a glorious and joyous ode to the pulp science fiction of old. Awesome fun, from start to finish, just straight up, pure entertainment. Now, when is the next one coming? This entry was posted in Book Reviews and tagged Adam Christopher, Angry Robot, atomic robots, atompunk, book, book review, Empire State, fifty books, pulp, Rad Bradley, review, sci-fi, science fiction, The Age Atomic by Chris. Bookmark the permalink.